WooCommerce Braintree payments download here. Once you have installed and activated the Braintree Payments plugin, you will need to enter your Braintree Sandbox API credentials into the plugin before you can start using it. To do this, navigate (in your WP Admin) to WooCommerce > Settings > Checkout > Braintree Credit Card (either at the top of the page where all the plugins are listed as text, or at the bottom where the enabled/disabled gateways are displayed). 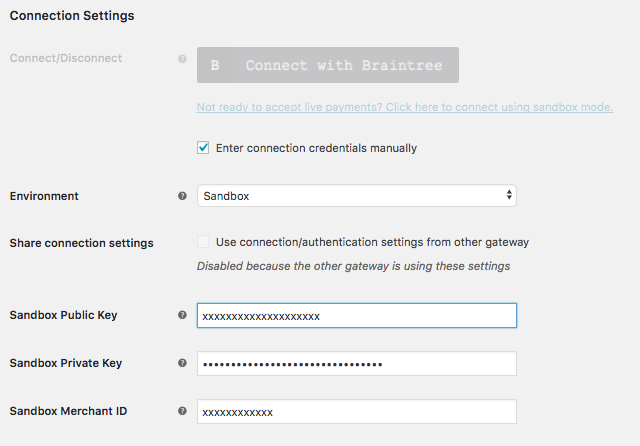 Once there, click "Enter Connection Credentials Manually", and fill in the Sandbox Private Key/Public Key/Merchant ID fields with the values provided by your Braintree Sandbox account. You will also need to ensure that "Allow customers to securely save their payment details for future checkout" is enabled under "Tokenization, as this is required for Autoship Cloud to create future orders. Once these have been set, click "Save changes", and complete a checkout from your store to ensure that Braintree is working. Navigate (in your WP Admin) to Woocommerce > Settings > Checkout > Braintree Paypal Payments (either at the top of the page where all the plugins are listed as text, or at the bottom where the enabled/disabled gateways are displayed). Once there, click "Enter Connection Credentials Manually", and check "Use connection/authentication settings from other gateway". You will also need to ensure that Tokenization is enabled for this gateway. Once these have been set, click "Save changes", and complete a checkout from your store to ensure that Braintree Paypal Payments is working. Make sure that "Test Mode" is enabled, click the "Payment Method Type" dropdown and select "Paypal", enter the API credentials from the previous section in the appropriate fields. 3. Complete a checkout using Braintree Credit Card Payments as the payment method, using sandbox credit card info, and filling in the "Create Password" field (this should be required). 7. Repeat steps 2 - 6 using Braintree Paypal as the payment method. 1. Create a Live Paypal Braintree account. 2. Navigate to WP Admin > Woocommerce > Settings > Checkout > Braintree Credit Card Payments, and change the "Environment" setting to "Production". Enter the API credentials from your new Live Paypal account. 3. Navigate to WP Admin > Woocommerce > Settings > Checkout > Braintree Credit Paypal Payments, and change the "Environment" setting to "Production". Enter the API credentials from your new Live Paypal account.